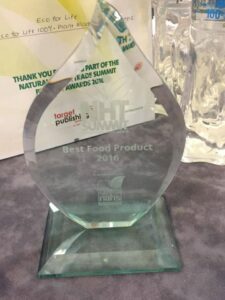 We are all delighted to have won the Award for Best Food/Drink Product for 2016 at the Natural Health Trade Summit in Association with the National Association of UK Health Food Stores. 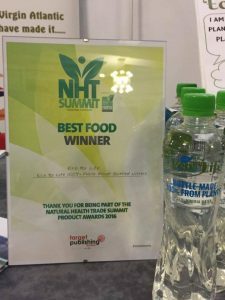 Our Eco for Life Bottles were voted Best Food Drink product by the Health store retailers at the Summit event winning by a huge majority vote this was a clear statement that our products were the Natural Winners. Bottled water is an everyday essential and consumers want a more environmentally friendly option and Eco for life is a fantastic alternative to on the go plastic bottles in the market in the UK and Europe. Our Award winning bottles are made entirely from plants so they are chemical free, natural and made from a sustainable source. Our bottles are also certified GM Free. Filled with the Finest New Forest still spring water bottled at source in the New Forest. Unlike Plastic polluting bottles which contain chemicals which can be harmful for your health and the planet our bottles can be put in the food waste to be turned into compost for growing more plants. For pure hydration on the go Eco for Life offer you the best eco-friendly healthy option in the bottled water sector. We will be sure to enter our bottles again for the 2017 Award to help raise the brand awareness. Consumers really want a sustainable, natural and chemical free choice when it comes to bottled water and Eco for Life is the answer. Hi. My wife and I bought a bottle of your water in Southampton. We are still using it for our bottled water in Guernsey where we live and are fully committed to the ethos. I would like to order a case of water to share and show friends particularly following the Blue Earth 2 series and the new moves to plastic elimination. I’m happy to pay for the pack, can you advise me on shipping costs please? We have a number of health food shops here. Yes we would happily look to send you some Eco for life across to you, please send an email to us and we’ll look at the shipping cost for you.